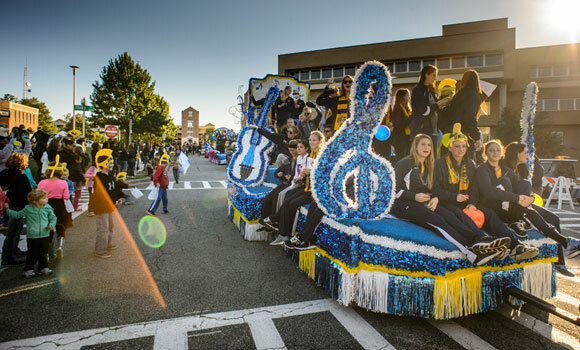 Meteorologists are calling for bright skies and crisp, autumn air this weekend – perfect conditions for UNCG’s Homecoming festivities. Homecoming events kick off Wednesday at noon with a celebration at Moran Commons for students and go through the women’s soccer game at 2 p.m. on Sunday against the Citadel, with most homecoming events taking place Saturday. Thursday evening is the Alumni of Distinction Awards Dinner, which will honor 15 distinguished alumni for their accomplishments in their career and community. The university’s annual bonfire and pep rally will be Friday at 7 p.m. at Kaplan Commons (EUC lawn). Saturday’s events begin at 9 a.m. with the third annual homecoming 5K race, sponsored by Campus Recreation. At noon, the university’s former rugby players will take on the current team in the 38th annual past vs. present match on the campus recreation field, which is part of the Rugby Reunion Weekend. The Homecoming Party at Kaplan Commons will begin at 4 p.m. and will include the School of Education’s Children’s Festival, photo booths, music, food, beverage and plenty of booths to visit. Twelve-piece combo band, I Love This Band, will be performing from 5:30 p.m. until 8:30 p.m. The annual Homecoming Parade of Chariots, a tradition since 1982, begins at 4:30 p.m. This year, four local marching bands or drum lines will participate, and the Homecoming Court will be introduced at 7 p.m.
UNCG’s men’s soccer team will take on Furman at 7:30 in the soccer stadium, and the Homecoming King and Queen will be crowned at halftime. A free fireworks show will follow the game. Throughout Homecoming weekend, there are a number of performances, sporting events and networking events that are free and open to the public. For a full schedule, visit the Homecoming website. Parking for all events on Friday and Saturday is free in the Walker, Oakland and McIver parking decks and all surface lots. UNCG invites the campus community to show its Spartan pride by posting photos from Homecoming events to Twitter and Instagram, using the #UNCGHome hashtag. People also can follow Homecoming updates on the UNCG and Alumni Association social media channels.